A grey stone panel of square format, the front carved in low relief with a couple of spotted deer on a riverbank and with stylised mountains and pine trees in the background. The recumbent doe holds a spray of lingzhi fungus in her mouth. The stag with prominent antlers stands watch over her with its head turned. The background is indicated by fine linear incisions and stippling. Deer are associated with the Daoist cult of immortality since at least the Han dynasty (206 BC – 220 AD) and are regarded as auspicious animals. Especially spotted deer were believed to have the ability to locate the lingzhi fungus of immortality, hence the spray of lingzhi fungus in the doe’s mouth; another auspicious reference to longevity. Deer also symbolise riches, because in the Chinese language the word for deer, lu, is phonetically equivalent to the word lu meaning good income. The original purpose of this charming stone panel is unclear. However, its format reminds us of Han dynasty clay bricks moulded with relief decoration that were made for the foundation of architecture. 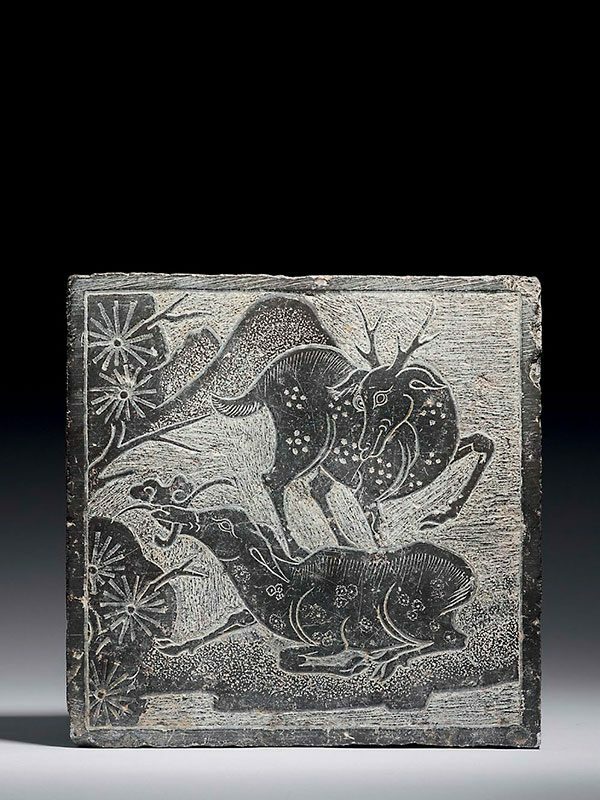 A rubbing of a Han dynasty brick relief depicting a stag with antlers, originally made for a palace, is in the collection of the National Palace Museum, Taipei. The present stone panel may have been part of a decorative scheme in a house, or could have been inserted into a piece of furniture. A closely comparable stone relief depicting a spotted stag with a branch of lingzhi fungus in its mouth is illustrated by Welch. A square ink cake with a spotted black stag motif, dated to 1573, is in the collection of the Metropolitan Museum of Art, New York. A jade brush rest carved with a couple of deer with lingzhi fungus, dated to the Ming dynasty, was formerly in the Qing Court collection and is now in the collection of the National Palace Museum, Taipei.